We went to visit our dear friend, Fr Dacian Bluma in Mishawaka, Indiana yesterday. 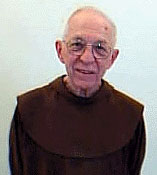 He is 85 and the former chaplain of the Franciscan Sisters of Perpetual Adoration and probably the most holy man I have ever come to know. Over the many years that Blaise and I have known him, he has been there for spiritual advice, helped in sadness, grief and shared in our tears and laughter. He most truly exemplifies the life of Jesus Christ and what being a priest is truly meant to be. He has recently been diagnosed with terminal cancer and was given 3-6 months to live. Although his body is ravaged with cancer, is frail and yellowed, his face radiates heaven. He appears ready to go home to the loving arms of Jesus. Here is a poem that Blaise wrote for him years ago, and it still applies today. As honey from a comb. They clap as thunder from the very throne of God. Yet has an abundance for those in need. Humility surrounds him tightly as a garment. And always anticipating servitude from himself to others. God’s love ripples out to those near by.